We had a great time. Will come back next year. 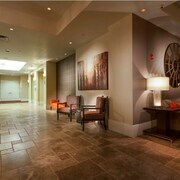 Nice rooms and friendly staff. One pool and bar was closed, Hopefully will be open next time. But harrys bar and grill was great. Had a blast. Staff was less than considerate most the time, but hotel itself was nice. Would stay here again. I liked the layout of the rooms, i liked the balconies. I did not like that the bathrooms don't have fans so it smells musty and has some mold in the bathtub, vanity warping. My bed was broken/worn out and a big lean to it. Could also use a coffee shop. I liked the cabanas and Bongos. Unique room layouts and amenities. Staff was friendly and very helpful. 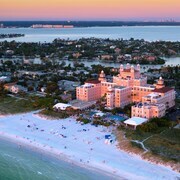 Situated on 5 acres, the all-suite Alden Suites is on the white sands of St Pete Beach overlooking the Gulf of Mexico. Great location for families Hotel staff very friendly. Rooms are a little tight for a family of 5. However we loved the beach access. Cheaptastic plane tickets booked? Check. Cheap and chic accommodation sorted out? You bet. 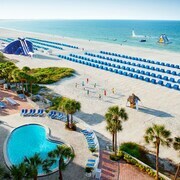 Now it's time to make your frugal vacation dreams a reality in St. Pete Beach! Where is St. Pete Beach? This destination is around 210 miles southeast of the capital of Florida, Tallahassee. St. Pete Beach is also 7 miles southwest of St. Petersburg. The Gulf Beaches Historical Museum isn't too far away from the center of this destination (and what's best — it's free!) Head there and examine the displays; there's nothing like working out your brain while preserving your bank balance. Forget about those serious galleries and museums and hang out with some interesting and unique creatures instead! At Suncoast Seabird Sanctuary, you'll learn a thing or two about the remarkable world of animals. When you step outside your hotel, it can be way too easy to start throwing around money. But that's not the case at Fort De Soto Park! It's a popular place have some fun outdoors. Why not wake up early and organize your own tour of the area's cheapest attractions? Keep a look out for Gulfport Tuesday Fresh Market. Leave the traffic noises behind and enjoy listening to waves lapping at the shore at Upham Beach. The sounds of the sea will be like music to your ears. Here at CheapTickets, you don't need to fret about bagging the cheapest deal. We've got it all covered for you, and we haven't compromised on quality for flights, hotels and incredible experiences. Some people think budget travel limits your options, but with us it's the complete opposite. With 500 partner airlines and over 500,000 properties across the globe, you'll have all the choice in the world. And when you combine your bookings on hotels and flights, you could save up to $481. Your inner cheapster can sleep easy with our Price Guarantee. It works like this — if within 48 hours you've stumbled upon your vacation deal for a better rate, we'll meet it and reimburse the difference. How's that for cheaptastic? We know it can be a challenge to part with your hard-earned dollars; that's why we started our simple rewards program. Just for booking a flight, you'll have real savings to use toward your next qualifying CheapTickets hotel reservation. Wondering exactly how you can access savings, exclusive bonus offers and penny-pinching perks? Simply log in to your account or sign up for a new one for free and then join the CheapCash rewards program. It's really that easy! Hi there, cheapster. We know you'd like to squeeze the most out of your vacation for the lowest amount of dosh, so why not suss out renting a car while you're in St. Pete Beach? It's a fabulous way to avoid forking out on high-cost cabs if you're going to hit up a lot of sights. Don't spend precious time puzzling over how to get a cab into the city. Collect a vehicle from the Tampa International Airport area and save yourself the stress. Thrifty Car Rental is a popular outlet here. Dollar Rent A Car can also be found in the vicinity. 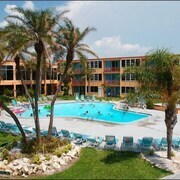 In the main area of the city, you'll find Dollar Rent A Car at 5005 Gulf Boulevard. Its convenient location makes for a simple pick up. Why not also look into Avis? They can be found at 5300 Gulf Blvd. 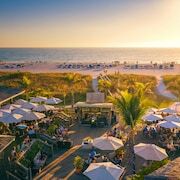 With no less than 92 hotels in St. Pete Beach, securing your ideal place to stay won't be too hard. We will make the decision simple, so you can start the ball rolling on your next thrifty getaway! Like to spend your cash on enjoyable things like tasty meals and awesome experiences? 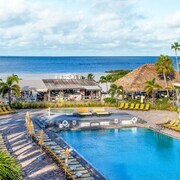 Then peruse some of our budget options, like the Pasa Tiempo Private Waterfront Resort - Adults Only and the Blue Waters Treasure Island.